Rutter’s Farm Stores is a company that is dedicated to keep in step with its customers. The business debuted in 1967 as an additional outlet for Rutter’s Dairy products. Today, Rutter’s has more than 55 Pennsylvania stores in York, Lancaster, Adams, Cumberland, Dauphin and Franklin counties. Named the 2010 Convenience Store Chain of the Year, Rutter’s is dedicated to creating an environment and experience that keeps its customers coming back. 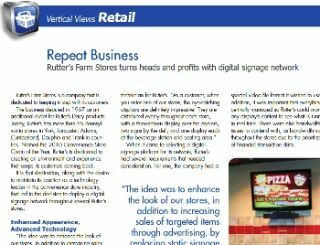 It is that dedication, along with the desire to maintain its position as a technology leader in the convenience store industry, which led to the decision to deploy a digital signage network throughout several Rutter’s stores. When it came to selecting a digital signage platform for its network, Rutter’s had several requirements that needed consideration. For one, the company had a special video file format it wished to use. In addition, it was important that everything be centrally managed so Rutter’s could monitor any display’s content to see what is running in real time. There were also bandwidth issues to contend with, as bandwidth varied throughout the stores due to the prioritization of financial transaction data. To meet its unique needs, the company turned to Vistacom Inc., one of the northeast’s premier A/V system integration firms. Xpresenter takes dynamic communications on digital displays to the next level, combining unprecedented ease of use with broadcast-quality video graphics. An end-to-end platform, Xpresenter is a complete suite of applications that allows users to create dynamic content for their digital displays quickly and easily, distribute the content and monitor activity on the displays using powerful remote management tools. While companies have offered to supply content for Rutter’s digital signage, the company has chosen to create its own, with a dedicated technical team that is in charge of content creation. With Xpresenter Template Maker 3.0, the team can create compelling content and schedule it straight from the familiar PowerPoint® interface. In addition, a “smart” object library allows for the quick and simple creation of content featuring videos, images, PowerPoint slides, RSS feeds, live information sources and much more. Xpresenter also includes support for 3-D effects, enabling the creation of innovative elements such as rotating graphics.